This week, I had the pleasure of catching up with two great friends, Emma Melrose and Shareen Geers from Llanelli. I just love a local hero story and here we have two ladies who are keen to make a difference to others lives, whilst setting and achieving personal targets and goals. The ladies told me that they started a running club last year with friends ranging from 28-52 who couldn’t run 5km at the time. They ended up running a half marathon and then looked for a way they could use this personal achievement to raise money for a good cause. They chose to train for the London Marathon and raise money for The Make a Wish Foundation. 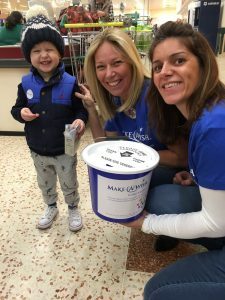 While they were bagging shopping for the charity in Morrisons supermarket in Parc Pemberton, they were approached by three separate families who had already benefited from Make a Wish. “It (the training) is a lot more difficult than we anticipated, mainly due to the weather. We all need time in our busy lives to mull over thoughts. Let’s face it, you can’t spend time in quiet contemplation while surrounded by ringing telephones, pinging e-mails and people asking questions nineteen-to-the dozen. Luckily, I have a place where I can go to think – I’ll explain where it is in a moment. Some of the things currently buzzing around my bonce are . . . The naughty kids in my neighbourhood have stopped spray-painting every available surface. So, is the writing on the wall for graffiti? Do you care how many hours of sunshine Moscow enjoyed last month? I don’t, but I know it’s ‘six’ because it was mentioned on Radio Four’s Six O’Clock news last week. The bank once had three ‘windows’, behind which sat three staff members who served customers. A second window was un-manned. Behind a third window, a member of staff was helping a customer with a complicated, time-consuming transaction. My thoughts as I stood there (and stood there a bit longer), listening to piped pop music and looking at a giant mural of cartoon characters used in the banks advertising, were . . . If the bank hadn’t bought the rights to animated characters most of their customers under 40 wouldn’t recognise . . . and if they didn’t pay a licence to play pop music customers can do without, they might have enough money to hire an additional member of staff in every branch! I’ve tried my best, I really have. Despite my weekly efforts to inform the world (well, this part of it anyway), it feels like I’m doggy-paddling against a tidal wave of indifference. But I won’t walk away from my mission. “What is your mission?” I hear you ask. Which isn’t easy to answer, as I’m in Coventry having my toe-nails clipped by a chiropodist named Dimitri as you read this. My mission is to correct irritating errors made by TV, radio and the press – including . . . . gasp . . . this esteemed publication. The Post recently ran a story about a flood at the Grand Theatre Swansea which caused two ‘showings’ of “Aladdin” to be cancelled. Showings? I almost spilt my avocado-on-toast flavoured latte. Cinemas have ‘showings’. Theatres have ‘performances’. Because that’s the sort of razor-sharp, killer repartee I’m known for. Media sources, including BBC News, stated that Fire and Fury, the new book about Trump, was released four days earlier than planned. No, it wasn’t! Films, CDs, prisoners and racing pigeons are released. Books are published. That’s why we have publishers and not ‘releasers’. Ever read that a new musical or play was ‘premiered’ in the West End? It wasn’t. Films have premieres. Stage shows have ‘first nights’. Even broadcasters who should know better (“Hi Elaine!”) often refer to a stage musical having a ‘soundtrack’ album’. It doesn’t! Films have ‘soundtrack’ albums. Stage musicals have ‘original cast’ albums. Bearing in mind the state of the world, you may consider my mission is of no importance. But, consider this . . . If broadcasters and journalists can’t be bothered to use the correct terminology in trivial stories, might they do the same with the bigger stuff? Clearly, many of us need to exercise more – and this time of year is an ideal time to start. I signed up for an exercise class and was told to wear loose-fitting clothing. Well, to be honest with you, if I had any loose-fitting clothing, I wouldn’t have signed up in the first place. Then I had a note and a plastic bag delivered through my letterbox, asking me to donate my unwanted clothes to the starving people of the world. I don’t know if this is legitimate or not, but one thing is for certain: anyone who fits into my clothes at this time is not starving. Even a brisk regular walk in the park is a step in the right direction, I suppose, but the weather doesn’t help. It’s been so cold here in Wales lately – while I was walking in Parc Howard, Llanelli last week I’m sure I saw a squirrel salting his nuts. I think the answer for me is to visit my mate GI Joe Personal Training in order to get fit and healthy. I’ll give him a call to meet up and discuss this over a big slice of cake and full fat caramel latte with chocolate sprinkles. See, I’m a lost cause . . .
As many more things irritate me now than 10 years ago, I think I’ve developed something that’s not mentioned in any medical dictionary – Low Tolerance Syndrome. While I can tolerate background music in restaurants, I become infuriated when music from a radio in the adjacent kitchen creates the teeth-grinding cacophony of two different tunes playing at the same time. Other drivers drive me crazy, too. Driving a car during busy periods in Swansea is like being in a war zone because, in a war, you never tell your enemy your next move. That’s probably why most drivers don’t use indicators. Please tell me I’m not the only one seeing this. Is it any wonder that road rage is on the increase? Very few road users have the time and patience for cyclists who whizz along our roads . . . and our pavements and canal tow paths, too, from what I’ve seen! Motorists are in such a rush, safety goes out the window. I’ve seen some ridiculous overtaking manoeuvres this week – the drivers in question risking their lives and those of other drivers just to get one space ahead. It’s part of today’s “I’m more important than you, mate!” selfishness. But things could be changing . . .
North Wales Police have introduced a scheme named ‘Operation Snap’ that encourages drivers to submit dash cam footage of bad and reckless driving, including another thing that drives me crazy when I see it – idiots using their mobile phones when driving. Let’s hope this idea is rolled-out throughout the UK, lowers accident figures and keeps us safe on the roads. So, the Christmas decorations are all down and safely stored away. When you think about it, Christmas is just a cardboard box in the attic now! By the end of this week, it is most likely that I would have broken at least three of my New Year resolutions – and probably four of the Ten Commandments. Why is it we head into January full of good intentions, yet find it so hard to stick to our goals? On the 31st December I filled the fridge with salad and ironed my running vest. By the 2nd January, I’m sitting in a well known coffee franchise, writing this column while sampling their freshly baked goodies and cream topped hot chocolate. At least I lasted one more day than last year. For many, January is the time of year when we feel in ‘limbo’. The fun and excitement is over and the harsh reality of paying for an elaborate Christmas hits home. There’s one question I always ask myself during the Christmas period: Whatever happened to soap on a rope? 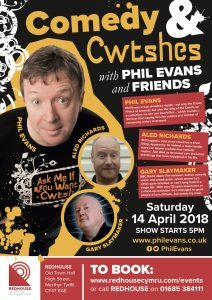 If you’re a Russian sleeper spy who’s been living undercover in West Wales for decades disguised as a Welsh speaker, you might whisper “Doh-Svee-Dan-Ya” in a Ceredigion accent – not something you hear every day. Except at chucking-out time at Lampeter’s so-called ‘Stamp Collectors Social Club’ which is actually a front for a cabal of Soviet spies – something the locals have known since they discovered that to become a member (A) you have to complete the application form in Russian and (B) membership is only open to people who’ve been awarded the Order Of Lenin. It’s difficult for me to make a judgement, mainly because I sat down with my mammoth Christmas edition of the Radio Times and a pen on December 24th, ready to plan my viewing over the next week – and by the time I’d gone through its 292 pages (a small forest was sacrificed to make every copy) filled with thousands of TV and radio programmes and marked-off what I wanted to watch and listen to, it was New Year’s Eve. I found the enormous line-up of old and new films, Christmas ‘specials’, game shows, sitcoms, comedy panel shows, children’s animations, music shows, ballets, documentaries etc completely overwhelming and absolute proof that it is possible to have too much of a good thing. I’ve wanted to de-clutter my busy life for some time, so made the first move on January 1st. Even though it contained details of programmes yet to be broadcast, I dropped the Christmas Radio Time into the re-cycling. Yes it took courage . . . but I did it! Why don’t you de-clutter your life in 2018? At least until December when the Christmas Radio Times arrives . . .
Waitresses and waiters have a tough job. Like me, they aim to give people an enjoyable experience. In cafes or restaurants my comedy radar’s always picking up the unintentionally amusing things people say, whether they’re fellow diners or waiting staff. Recently I went out for a meal with three friends. Our young waitress was pleasant and professional – but every time she brought a dish to our table, she’d say “Theeere you go!” in a high-pitched voice.